You can research signs of narcissism and educate yourself on what it is like to have a narcissist in your life. 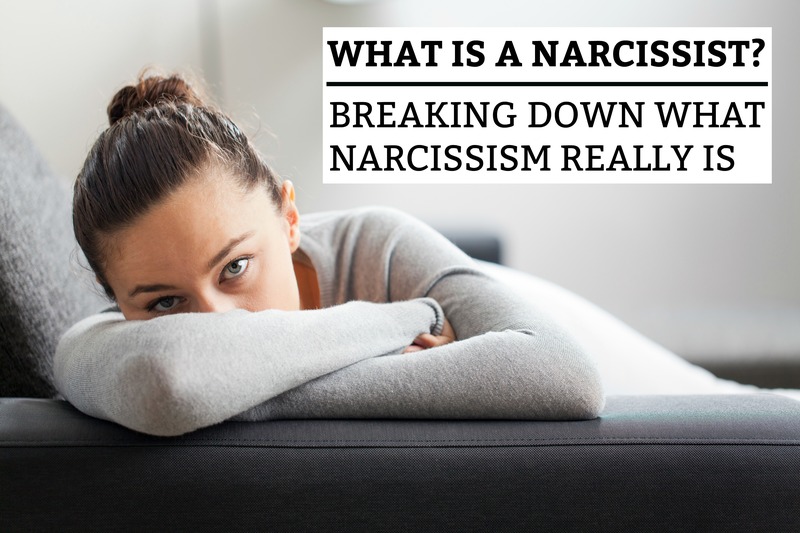 However, what really is a narcissist and what makes them who they are? Let’s break down what narcissism really is below! The narcissist is in love with an idealized and grand image of themselves! This inflated image allows them to avoid the fact that they lack self-confidence and are deeply insecure individuals. By creating a facade of superiority, they are able to convince others that they deserve respect, admiration, and a place of authority. This facade can come in different forms. Perhaps the narcissist tries to make themselves look wealthy and successful. Sometimes, they even gain attention by making themselves the greatest victim in the room. The brilliant person who was never appreciated and whose great talent was never discovered. Whatever facade they paint for themselves, it always accomplishes their #1 goal – to gain attention. Why? Because the narcissist’s energy-supply comes from the attention of others! Simply put, the narcissist gains their energy from the attention of other people. This is the #1 reason narcissists want to draw people to themselves by looking so grandiose and superior. People = Energy (just like a leech). Narcissistic supply is like a drug to them. Without the attention, admiration, and ability to belittle others, the narcissist will be forced to feel the pain and humiliation of their own insecurities and self-destructive tendencies. Emotionally healthy and normal people are the source of their own energy! This is where good moods and an excitement for life comes from. Narcissists, on the other hand, are vampires and leeches – always sucking the life out of other people. Related Article: What Does The Bible Say About Cutting People Off (Going No Contact)? In normal, healthy relationships, people understand that mutual respect and ‘giving of oneself’ is the foundation for lasting affection. This is called genuine, unconditional LOVE! However, for the narcissist, they expect others to freely give of themselves. Here is the catch. The narcissist believes that they deserve a never-ending supply of narcissistic supply and that they should never have to give anything in return. At the core of narcissism is a twisted self-obsession. BUT, the narcissist isn’t stupid. They also love to see themselves as generous and selfless – once again lending to the facade they have created in their own minds. When it comes to acting generous, the narcissist can be very good at faking it! Although the narcissist is self-obsessed, they know that they need to keep their ‘narcissistic supply’ close to them. When they see someone getting suspicious of their selfish tendencies, they may “Love Bomb” them. This happens when the narcissist showers someone with adoration and tokens of their affection. …gifts, flattering comments, excessively loving social media posts, flowers, cards, etc. If their “victims” continue to distance themselves from them, they can then blame them for using them. …they can go from being your best friend to your worst enemy in 5 seconds! One minute they are giving you a gift and the next they are belittling you in front of others. Because when the narcissist feels threatened by something or someone, they have to destroy it. Perhaps they feel like you are shining brighter than them and taking the attention off of them. Maybe they feel like you aren’t giving them the attention they deserve from you. Or perhaps they just want to remind you that they are boss! They are in control of this relationship and you exist to make them happy. Whatever the reason is, their cruel behavior is a defense mechanism. When they perceive something as a threat, they always feel the need to put down whoever is creating it. They do this through subtle attacks: name-calling, bullying, bringing up an embarrassing story, using personal information against you, and downright lying about you. Sadly, they can only see their own needs. The only thing that matters to them is themselves. The narcissist is ‘allergic’ to criticism. Anything that threatens to “burst their self-made fantasy” is met with extreme defensiveness, denial, anger, sulking, blame-shifting, guilt-tripping, insults, spreading rumors, etc. They are never wrong and nothing is ever their fault. If someone does come to them with an accusation, they will always play the victim and shift blame onto someone else. The narcissist hides behind a mask of self-confidence and superiority. To admit that they are wrong is to admit that they are weak and inferior to you. Even when someone is genuinely concerned and lovingly confronts them, it will never be received well. No amount of loving words, kindness, or sincere concern will help the narcissist see their own inadequacy. According to Dr. Ramani Durvasula, an expert in narcissistic personality disorder (NPD), says she never seen anyone classified as a narcissist actually change. The dialogue below is from this interview with MedCircle. Dr. Ramani recommends that if you have a narcissist in your life, you must get into therapy with a therapist who knows how to deal with the narcissistic personality disorder. What Does The Bible Say About Cutting People Off (Going No Contact)? If you have a narcissist in your life, you have two choices. Stay and manage your expectations (because they will never change) OR leave and expect a very messy and hurtful departure. Their goal will be to destroy you and your reputation if you choose to leave and “cut off” their narcissistic supply. Cut off all forms of communication and NEVER go back on your decision. If you choose to stay and fight with the narcissist, you are continuing to be their narcissistic supply. Fighting actually empowers the narcissist and weakens you. This article about getting toxic people out of your life is a great place to start! Why do I feel like I love this man so much and that everything is my fault? I know he doesn’t care about me. He’s hurt me physically, emotionally, mentally and financially, but I can’t let him go. What am I missing? Why can’t I let go and be happy? Hello Cindy! First of all, I want you to know that I am not a professional therapist. However, my first piece of advice would be to go to a therapist that is familiar with Narcissistic Abuse. From my research, you sound like a CLASSIC victim of narcissistic abuse. This is not an article I have written, but I believe you may see some of your tendencies listed here. Again, NEVER be ashamed or hesitant to see a professional therapist. A good therapist can help you more than you will ever know! If you prefer a Christian counselor, their profile will also specify that. Also, if you have health insurance, check and see if they offer several free therapy visits every year. Many insurance companies now cover therapy sessions as preventative care. Thank you for your articles, I have been married 56 years now to a narc.My daughter found this info. first,I have been reading all I could trying to figure out my husband,he was violent so we had to be on guard.I am a Christian, I had no one or anywhere to go for our safety so we endured.Now he is in a nursing home with dementia and other health problems. I have not been in contact for about 9 months now,we are trying to heal.My daughter is a Christian also. Hello Mar! I’m so glad that you found our articles useful. My husband and I are both strong Christians as well. 🙂 You are a very strong woman for having lived your whole life with a narcissist. Recently, I wrote an article called “What Does The Bible Say About Cutting People Off (Going No Contact)?” The Bible talks about people who are divisive, abusive, back-stabbing, proud, and unforgiving. I am so sorry for your current health situation, but so happy that you and your daughter now have some time to heal. <3 The Bible makes it clear that it is right to put up boundaries with people who are narcissistic. If your husband does try to come back into your lives, so he can gain more narcissistic supply and continue to hurt you, it is OK to say, "No, you are not allowed to come here anymore." He cannot continue to harm you and your family, especially now that you are ill. The best way to heal from narcissistic abuse is always "No Contact". This is very Biblical.